AND so ONCE again, like a yearly visit to the dentist, the time has come for Monza and the Italian GP. Already for a month you feel lousy as you know that our charming Monza friends, regardless of the fact that the Italian motor industry is in an extremely precarious state, will do their level best to alienate every foreign journalist present by deliberate rudeness, lack of cooperation, and blatant obstruction. A great many journalists don't even come here because they are not allowed to do their job by the sponsoring club or the so-called "police." Just recently one of our number was slung into jail at Enna while working a G P because the copper claimed the Englishman "spat" on him. And all this to preserve the fancied Italian dream. At that it took a bit of shaking as Ferrari was indulging in the politics that are his pride and joy, intimating that he wasn't going to bring his GP cars for the Grand Prix. The reason for all this remained a mystery, unless he was holding out for a percentage of the gate, until some disinterested party dropped a word that Ferrari might change his mind if the Inter-Europe Cup, a big GT event on race morning, were eliminated. Why? Because the Cobras were coming and they might prove faster than the GTO Ferraris. So this was done. Then, just before September 1, when Cobras, etc., were. elsewhere, telegrams went out to selected GTO and 275-LM owners inviting them to race in a GT and Prototype event on Sept. 5th! All this was mixed with another complicated rumble with the FIA's Commission Sportive Internationale concerning the homologation of the 275-LM as a GT car in time for the Tour de France or, if it comes to that, the Coppa InterEuropa mentioned above. A couple of observers were sent down to Modena where they were snowed with a bunch of order blanks, etc., and shown a fair number of chassis but, as you will no doubt recall, the homologated GTO never had anything like a hundred made. The CSI pushed energetically by Porsche (which has instituted healthy production of 904s at the expense of the 6-cyl 906, Shelby-American, and a couple of English manufacturers-held a special session and enraged the old man by refusing to homologate the 275-LM just yet. Leaks about the new GT Ferrari with all-independent suspension but the engine in the front may have influenced them a bit but they would probably have assented anyway had not Porsche's Yon Hanstein and Shelby himself screamed quite so loudly. Lots of knees and elbows in this gentlemen's sport, aren't there? Ferrari promptly got up on his hind legs and announced that he wasn't going to race in Italy any more. If this is true, I applaud it as it may mean that the Italian GP will fall by the wayside and make all our lives that much more pleasant. to flat as to make no never mind. This was fitted into the usual modified "aero" chassis, which in fact was designed for it and thus didn't look all that different except for the extra number of fuel-injection horns sticking up. The dodecicilindri showed up for the second day of practice, but as it was raining didn't turn any fantastic time in the hands of Bandini. Because there wasn't enough concrete information in hand about fuel consumption and general behavior, Surtees or Bandini didn't want to drive it as they were well up to their normal V-8s. Scarfiotti wasn't regarded as quick enough to find out anything useful, and the fuel injection was playing up anyway so the engineers decided not to run it. We had one 12 anyway from Honda, a nice new car which they had built since Bucknum's Nurburg Ring shunt (the steering broke) and with their own fuel injection installed. Much to the disgust of Bosch and Lucas, who have spent ages getting theirs sorted out, it worked pretty well aside from a certain reluctance to start on the button. Richie Ginther, whom rumor hath will leave BRM and go to Honda (you'd be surprised how many people have asked about the job), turned a few useful laps and even new boy Bucknum turned a 1 :40.4 (as fast as Ginther's BRM) in spite of spongy brakes and a tendency to overheat. BRM likewise trotted out a new car in which the exhaust pipes came out of the center of the Vee, and provision for twin ignition although one plug per cylinder was used. a heck of a lot neater than the old A TS. Apparently the English tuning firm of Derrington has bought A TS racing plant and will do a "customer's racer" with a later possibility of producing the GT cars if A TS financial position doesn't improve. As one would expect, there was a lot of welding during practice as weakened components showed the effects of their Zeltweg hammering. Chris Amon's Lotus had had about an inch of movement at the bulkhead, Bob Anderson's Brabham was collapsing around him, Innes Ireland's suspension fell apart as he was coming out of the pits, Brabham was welding on his frame, and McLaren didn't even practice on Saturday as they only had the one engine. Things get pretty fraught towards the end of the year. Anyway, the grid finally resolved itself as shown, Fearless John simply howling around to get the best time and Graham Hill third best in spite of still wearing his pneumatic collar for that neck injury. It is still bothering him on long curves, which must be quite a trial at Monza. After the requisite G T races, which were won by Moser (Alfa GTZ), Slotemaker (Porsche 904), and Vaccarella (Ferrari 275-LM), plus a dragster demonstration, everyone trickled out and lined up on the false grid. A hand-operated mixture control assured that the Honda fired up with the rest, thus saviing us the sight of a battalion of flashing white sneakers pushing and possibly mass hara-kiri. The starter stood up by the normal departure line, an assistant holding up time boards, and then as the start got closer, he beckoned them aU to him. Slowly they all moved forward and while the backmarkers closed up and the front-liners crouched in an inferno of sound waited-and waited-and then suddenly dropped the flag. Graham Hill's BRM didn't budge an inch as the cars on each side of him got away, and hastily one hand shot up while the other fumbled with the gear lever. As the field streamed past him and out of sight, he made a couple of abortive efforts to get it going but then hopped out and pushed it backwards to the pits. All for naught, as the leaders screamed by, for the clutch with drawal fork's roller bearing had seized on its shaft, stubbornly resisting efforts to budge it. Bitter disappointment indeed after winning Monza the last two years. As for the World Championship aspect, the other aspirants were busy carving each other up to keep from being run over, with a determined Gurney first out of the South curve and past the line, just, with Surtees passing McLaren into second and Clark close up in fourth, followed after a slight gap by Bandini, Bonnier's blue Brabham, Ginther's BRM, Brabham, Ireland's squat BRP, Siffert's Brabham, Baghetti's red BRM, Scarfiotti's V-6 Ferrari, Bucknum's Honda, and' the rest, with Trintignant's blue BRM at the back. Not a good position for the Mayor of Vergeze but somebody's got to be last. On the next lap, a mighty roar went up as Surtees was seen to be leading, but the other three stuck as close as wallpaper as the Ferrari No. I towed them away from the secondary group. That fascinating exercise of high-speed slipstreaming was going on which is only practiced at the really quick circuits like Spa and Reims. At Spa it is all very well to tuck in behind J. Clark if you have guts enough to stay with him through the twiddly bits, but at Monza there is only one really spooky corner; the Curva Grande. The fellas in the draft thus can motor along in a comparative vacuum building up speed until such time that they feel the radiator should get some air or they get tired of being bombarded with pebbles and then pullout to pass. The bloke in front has generally got his eyes on the mirrors and lets them by, not that he can do much outside of shutting the gate with a bang, but most are good boys as they know that the gate will shut on them next when they are trying the same dodge. on the pursuing nebula consisting of Ginther, Bandini, Bonnier, Baghetti, Brabham, Siffert, Bucknum, Ireland, Scarfiotti, Anderson, Spence and Hailwood till he over revved it), while Cabral, Revson and Trintignant were spaced out behind. The order of this seething mass varied infinitely from lap to lap, with Bandini, Ginther, Bonnier, Ireland more often than not in front although Brabham, Baghetti and Bucknum all took turns as well. Bandini seemed to be a trifle obstructive as the lap times were a trifle slower when he was in front, not to mention heartfelt comments from some of the others about his cutting the corners short and throwing rocks at them, and the weaving about as Ginther or one of the others would try to shake his tow was heart stopping. They would all come out of the Southcurve in one mad bunch and then explode violently in all directions trying simultaneously to scrape off their pursuer and pass somebody else. Ireland very nearly had the lot when he got all sideways on the grass at Lesmo, Baghetti shot past Ginther on thy inside coming into the Curva Grande and then almost lost it coming out, and Scarfiotti made the day's biggest mistake when he tried to bluff two other cars out of the Southcurve approach and then found that they were Ireland and Brabham. After a certain amount of motoring on full left lock, he rejoined the race some ten seconds behind his group. The most significant thing, though, was when Bucknum got tired of seeing wheels within wheels, pulled out and drove past four other cars and Ginther to take the secondary lead (5th overall) out of Lesmo. The Honda brakes had been forcing him to use Ginther, among others, as an additional stopping factor already, and besides he began to get sprayed with water and oil from the front-mounted tanks so he quit. One suspects a leaky sealing ring somewhere like the early Climaxes but at least he showed that the potential is there. We were so busy sweating out this complex that we scarcely noticed Gurney and Surtees swapping the lead back and forth, never once letting McLaren or Clark have a look-in. On the ninth lap, Surtees turned 1 :40.4, just a tenth faster than Vaccarella's fastest lap in the GT race, and he was also 13.6 sec ahead of Brabham leading the second bunch. 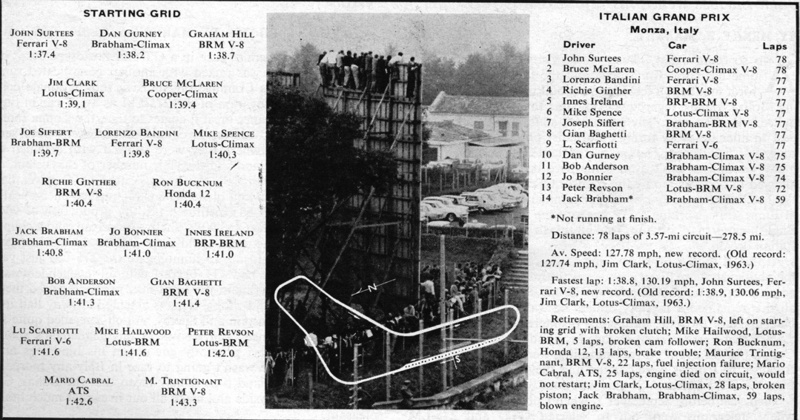 At the rear, Revson pulled up to pass Cabral, who was having some trouble getting more than 9500 out of the A TS, and a few laps later Trintignant overhauled them both, only to commence a series of stops with fuel feed problems. An ambulance went out on the course, giving rise to some frenzied counting, but nobody seemed to be missing. He was probably just late for work, and the least he could have done was to give Cabral a lift back when his engine quit on the 25th round. Scarcely had he retired, though, when Clark came rolling in with the engine sounding terribly rough. After an exploratory lap he too retired when head mechanic Jim Endruweit noticed oil coming out of the exhaust pipes and water from the injection horns; another strong contender through. McLaren suffered from Clark's misfortune as well, as the Lotus's sudden slowing down in theSouthcurve caused him to lose touch with Messrs Surtees and Gurney and put him out on his own. Gurney evidently missed the company or had Clark made a mad dash for the front as he came by looking intently over his shoulder, when Clark rolled in, but he had plenty to occupy him with Surtees' Ferrari. So the race wore on with the Brabham and the Ferrari out in front; McLaren's Cooper holding third about 12 sec behind, and the most diabolical things going on in the third bunch. One lap Ginther would swing way out, raising vast clouds of dust, and the next he would lead a long string right under the pit wall, causing all concerned to lift their signal boards sharply. Anderson Had dropped back, driving the only carburetor car in the race, and now on the 39th lap Surtees came up to lap the swirling mess and turn the race's giro piu veloce of 1:38.8 or 130.19 mph, to try and lose the determined Gurney. No luck, as they flitted through warily, but their passage broke it up into three groups consisting of Brabham-Ginther, Ireland-Bandini-Bonnier, and Baghetti-Siffert-Spence. These motored along pretty much the same, with Brabham taking a tenuous lead into 3rd position, until Ginther noticed some curious puffs of smoke coming from Brabham's exhaust pipes. He slacked off a bit, not wishing to become part and parcel of a Climax, until finally on the 59th lap it went Bang and poor Brabham was out. Bonnier had already stopped after one of his best drives when the battery went flat but rejoined a bit later. These developments put still more gaps into the order and now it was Ginther all on his own in third, Bandini and Ireland closing on him, and Spence keeping company in the surviving works Lotus with a tiririg Baghetti and Siffert, who was suffering more than somewhat with the fumes and heat. 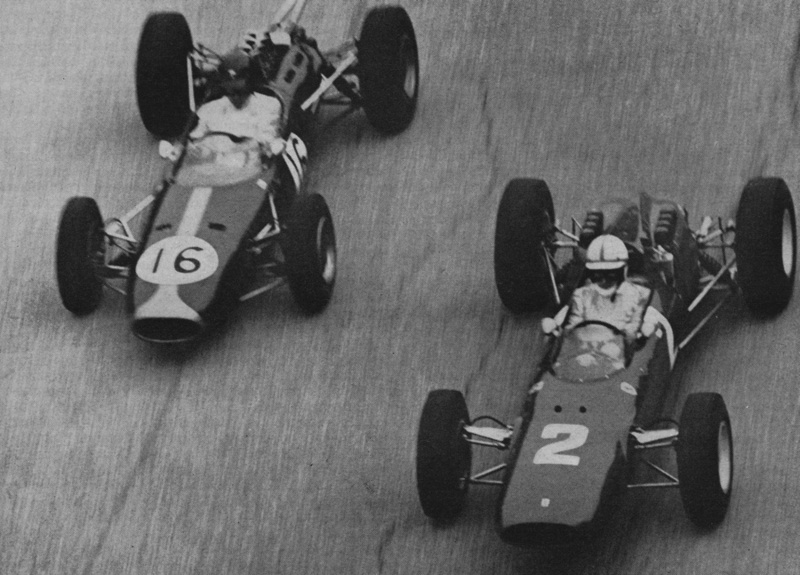 As the race started drawing to a close and we commenced to wonder exactly what was going to happen on the last lap, Surtees started to open up a bigger and bigger gap between himself and Gurney, whose Brabham was commencing to splutter. Finally the unlucky Dan came in, while his pit crew splashed water over the fuel pump (they had had trouble with this in practice) but the spluttering continued and he circulated more and more slowly. The trouble was finally diagnosed as a duff rectifier which made the battery sub-standard, but the fat prize money was not in Surtees' pocket. Revson made a pit stop for the same cause, eight laps from the end, and Ireland lost his hold as the BRM engine commenced to sound as if it were running on about three. final and78th lap rolled around and Surtees flashed across the line, followed by McLaren, we all waited to see what would happen. Bandini-and Ginther came out of the South curve together, Bandini swerved to the inside, narrowly missed the crowded pit wall as he chopped the BRM off, and took third by a matter of feet to wild cries from the partisan crowd. Gurney rolled into the pits not even bothering to take the checker, Baghetti beat out Scarfiotti, and the spookiest race I have seen for years was over.